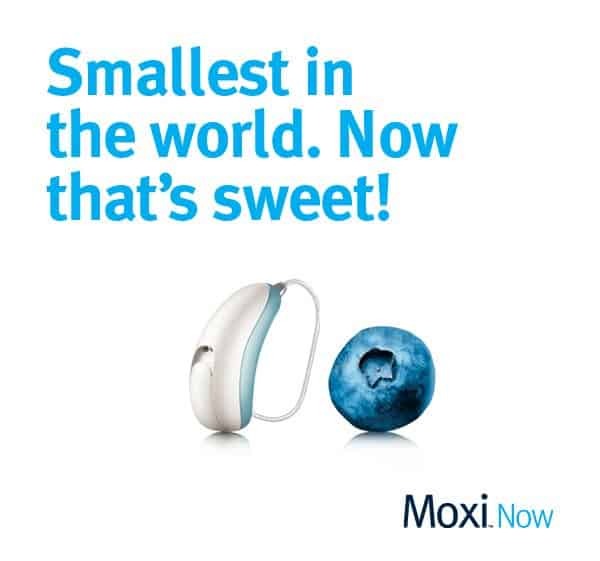 Moxi Now is the size of two blueberries stacked one on top of the other – making it the world’s smallest receiver-in-canal (RIC) aid. Receiver-in-canal hearing aids are already, by design, quite small and discreet. Moxi Now packs a lot of power even in this small package. Built with Unitron’s Tempus Processing Platform, Moxi Now provides wearers with access to clear sound, a natural listening experience, a long battery life, and excellent speech recognition. Tempus is the processing platform that powers Moxi Now, among other new Moxi aids. Tempus is designed to adapt flexibly in different environments, with specific classifications of sound in the SoundNav feature. Tempus offers special channels to different kinds of speech noise: from conversation in quiet to conversation in a small group to conversations in crowds and noise. Tempus offers wearers a full picture of sound without distortion, with a 101-decibal dynamic range. Features such as Speech Zone 2 and Sound Conductor enhance the listening experience in a number of different environments. While traditional platforms focus solely on speech sounds, Tempus takes sound innovation a step further, with My Music. For music lovers, My Music captures the diverse frequencies of music, providing a rich listening experience. Tempus’ tightly integrated algorithms and dual-core processing make it a front-runner in the industry. Moxi Now is an RIC hearing aid, which means it is worn over your ear, with a small, custom-molded receiver that rests inside your ear canal, feeding you clear, high-definition sound. Moxi Now is available in three technology levels – Pro, 800, and 700. In all technology levels, Moxi Now offers natural sound balance, data logging, feedback elimination, wind control, and wireless connectivity to phones and other devices. Built on the Tempus Platform, Moxi Now offers features such as Speech Zone and Binaural Spatial Processing. With hearing loss, people tend to struggle with speech intelligibility and to locate the source and direction of sound. 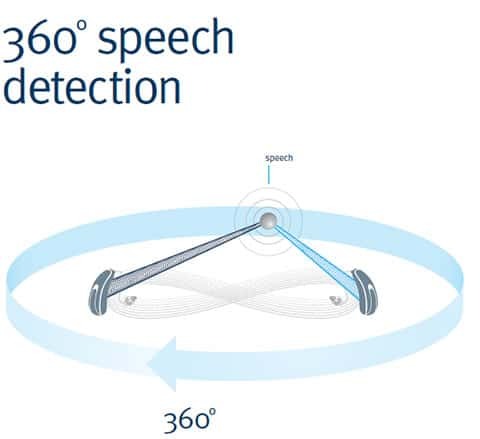 Speech Zone 2 automatically adjusts Moxi’s microphones to focus on the speech you want to hear. Binaural Spatial Processing activates Moxi’s microphones to work together, sharing audio data, to help you determine the direction of speech. This also helps to directionality for wearers. For a clearer overall listening experience, Tempus’ SoundNav feature identifies, analyzes, and balances different sounds from the wearer’s environment and assists with directionality and transition between locations and conversations. Sound Conductor also assists in balancing sound and provides a natural listening experience. Moxi Now is equipped with features to suppress and track background noise, and compress frequencies to provide an accessible and comfortable listening experience. For some degrees of hearing loss, frequencies in the higher range could cause difficulties. Additionally, Moxi Now’s AntiShock feature anticipates and softens loud, sudden, sharp sounds (such as a door slamming) for an even more comfortable experience. Everyone hears differently, which is why the hearing aid fitting process is a very important step in hearing health. Unitron takes this process very seriously and offers software that focuses on the intricate details of customized hearing aid fitting. 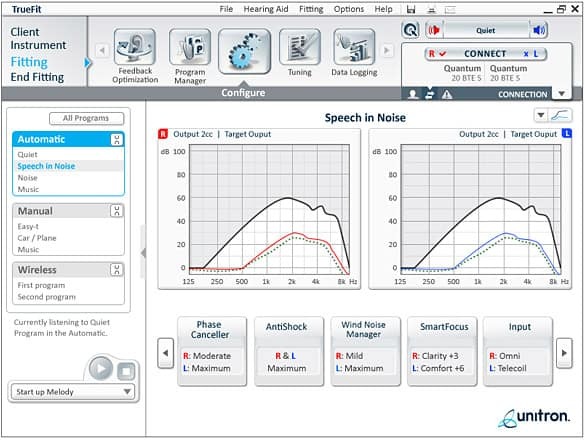 TrueFit Software is a collaboration between Unitron and hearing healthcare professionals to streamline the customization and fitting process for Unitron aids. TrueFit logs wearer preferences over a period of time, which allows hearing professionals to fine-tune your hearing aids to your specific needs. Log It All archives your preferences as you move through different environments, and provides an added layer of data useful to your hearing instrument specialist. Flex Trial allows wearers to “test drive” Unitron aids with Log It All, which gives wearers the opportunity to find the best fit while also providing hearing professionals the data to provide the most personal customized listening experience. Interested in trying a pair of Moxi Now hearing aids? Our hearing professionals are experts at helping people to find the right hearing solutions for them. We invite you to contact us today to schedule a FREE hearing test at one of our Pennsylvania locations.